Disc-equipped light tourers have taken over somewhat from cyclocross (and cyclocross 'inspired') bikes in the last year or two as the new super-versatile do-it-all platform. Plenty of them are good, but not many of them are as good as the Jamis Aurora Elite. It manages to balance just the right amount of speed on the road with just the right amount of load-carrying and all-surface capability, in a well-specced and good-looking package. The frame of the Aurora is Reynolds' touring-staple air-hardened 631 tubing, which is stronger that the standard Cromoly (520 in Reynolds parlance) that you often get at this kind of money. It's well made and well finished, with a matching Cromoly fork that sports a decent amount of rake promising a bit of compliance. Rack and mudguard mounts are all present and correct, as are low rider bosses on the forks. 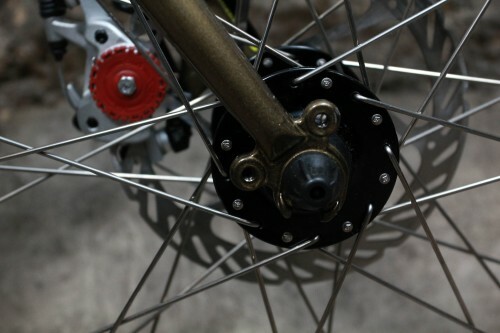 The bike is disc equipped - in this case Avid BB7s - and the rear calliper is in the now-de-rigeur position between the stays, which makes mounting a rack much easier. 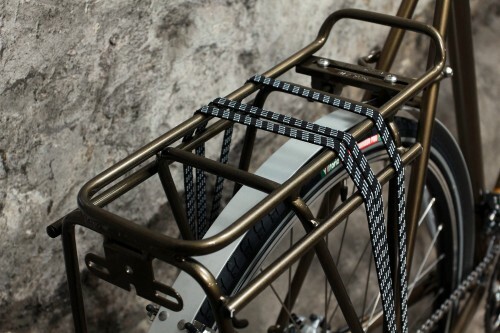 You don't need to mount a rack in this case as there's already one fitted, painted in the same colour as the frame. SRAM Apex shiftgear performs transmission duties and the midweight wheels and dependable finishing kit (including a neat height-adjustable stem) mean the bike weighs in at a reasonably chunky 12.7kg/28lb for our 59cm test bike. Out on the open road, though, the Aurora zips along with a dynamism that belies its weight. I've piloted a fair few disc-equipped 700c bikes in my time and this is undoubtedly the best I've tried for distance at a reasonable speed. The frame is at once responsive and extremely comfortable - that comfort helped in no small part by the excellent Vittoria Randonneur tyres - and the net result is a bike that's a super place to be for a ride of any distance. To put the bike's performance into context, the longest ride I've taken the Jamis on so far is a 125km jaunt from Southampton to Bath, a route I've ridden a few times before. The Jamis managed it in a round five hours, averaging 25km/h including a couple of short stops. That won't have the pro peloton looking over their shoulders, but for me that's a fair old lick, and considering my current fitness (has been higher) and weight (has been lower) it's not materially different to the last time I rode the route, on a Genesis Equilibrium that's fully eight pounds lighter. The Jamis has spent plenty of time on lanes that have taken a beating over the winter, and towpaths and light trails too. It handled all that with aplomb and without a single puncture, which is impressive given the miles it's covered. Comfort is a performance advantage - we like saying that on road.cc - and this is a really comfortable bike. The position is sporty tourer, and the fact that the stem height is adjustable on the fly without disassembling the front end is a bonus: if you fancy going at it for a couple of hours, you can drop the stem to the bottom of its range and it quickens up the ride position noticeably. By the same token, if you've beaten yourself up over a long ride you can relax the position for the final stretch. The Ritchey Biomax bars are very usable in all positions - some will prefer a longer dropped section - and the Jamis branded saddle was decent enough, though it did click like the lid of a jam jar every time I went over a bump, which was kind of annoying. SRAM Apex running gear will take a bit of getting used to if you've never used the system before but I've never had any problems with its functionality, and the weight and build quality are comparable to Shimano and Campag equipment at this price. The compact chainset and 11-32 cassette give a big range of gears, plenty big enough for any unloaded riding. The one annoying foible of SRAM doubletap is that if you're feathering a change up the block and it doesn't click in, when you release the lever you'll find yourself in a higher gear than when you started, not ideal when you're struggling on a climb. Apart from that, the transmission was pretty much faultless throughout testing. Okay, I've come this far without mentioning the mudguards. The first thing you need to do if you buy an Aurora is remove them. Or the front one, at least. Those Bladerunner guards may look pretty, but they're an absolute horror show. For a start, they're set miles away from the tyres, which themselves are pretty big units. And they're attached to the low rider bosses for some reason, putting them out of action. The big gap means toe overlap, lots of it. I mean lots, in the sense of not funny at all. You will catch your toes on the guards, and because they're solid Aluminium they'll bend, and stay bent. I found this out when coming to an abrupt halt in city traffic, and bent the guard to such an extent that it fouled the down tube and meant that I couldn't steer to the side of the road; I had to dismount and walk through the cars to the side of the road which luckily was embarrassing rather than dangerous. Jamis are aware of the issues and the guards won't be used on the 2012 bikes. Once I'd taken the front guard off toe overlap ceased to be an issue. If you ran a 28mm tyre with a close fitting guard you'd be fine too. It's disappointing that the bike is specced with such awful guards, and it makes for an awkward first date. 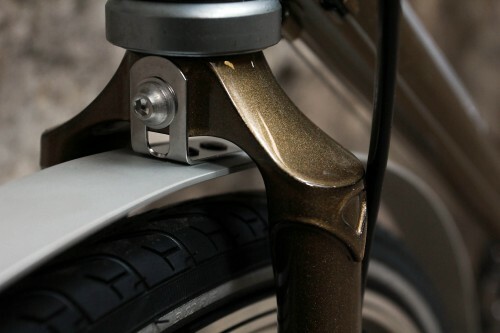 But it doesn't materially affect the bike's performance overall. So what kind of bike is it? Well, it's not an expedition tourer. Load the bike up with a lot of weight and that springy steel frame is a bit too springy. It's manageable but it's not the rock solid platform that, for example, a Kona Sutra is. By the same token the 32-spoke wheels are solid enough but not what you'd spec for the Karakoram Highway, and Apex is unproven in that context too although I'd have no more qualms about using it than any other similarly priced integrated system. If you're looking for a genuine do-it-all machine that will handle a bit of load carrying, though, it's definitely worth a look. You could happily commute with a pannier, then throw the bike in the car and ride an Audax or a sportive. Okay, you won't be as quick as some of the all-out racers, but you'll probably finish before plenty of people on much sportier bikes, in more comfort. If you were doing an end-to-end or short tour with light loads, it'd be just the ticket: fast enough to make good progress, dependable enough to rely on. If you don't have room for a big stable then the Aurora Elite will do the job of more bikes than most. 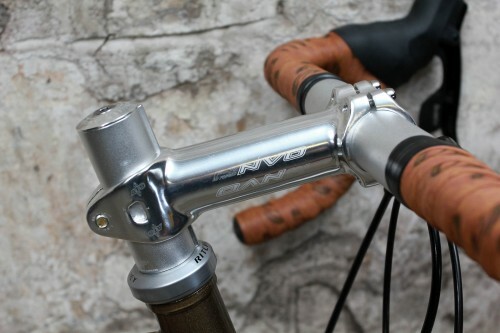 Headset: Ritchey Logic V2, Aheadset, 1 1/8"
The Jamis Aurora 2011 touring Bike. Road bikes are too light duty. Mountain and city bikes are too heavy duty. Welcome to the Just Right world of Aurora Elite, the town bikes for smart urban speedsters and cyclo-tourists. Legendary Reynolds steel is Jamis' chassis material of choice, for its unbeatably robust performance and the resilient ride-damping you'll appreciate while loaded up and bombing around on the streets. This is magic stuff, especially for full pannier touring and rough-road adventures. The Aurora Elite gets SRAM's new Apex group, with double-chainring shifting and a huge gear range that's lighter and faster than a repurposed triple-ring MTB gearset. With the guards on there's far, far too much. Take the front one off and it's fine. I'm looking for a faster commuter/lt touring bike than my old Mtb that I converted in to a commuter. Both the Slasa Vaya and the Jamis Aurora Elite sound like good choices. I live in a very wet climate so discs are great and mudguards are essential... The bike I choose would be for 70% commute/training rides 30% lt touring. Don't have ready access to test ride either bike. The three most important qualities I'm looking for are more speed, comfort and durability. Your reviews of the Vaya and the Aurora Elite are very similar. Tough choice, any suggestions? it is a tough choice, they're both very nice bikes. The Vaya is better if you're planning to venture onto the trails, if you're staying on the blacktop the Aurora is a bit quicker. Both will take 'guards but like i said in the review above, the ones specced with the Jamis are awful so budget for some replacements and make sure they're fitted close to the tyres; this might mean getting a bit creative under the for crown in particular as there's a big gap there on both bikes. to be honest i'd be quite happy to have either in my permanent stable. 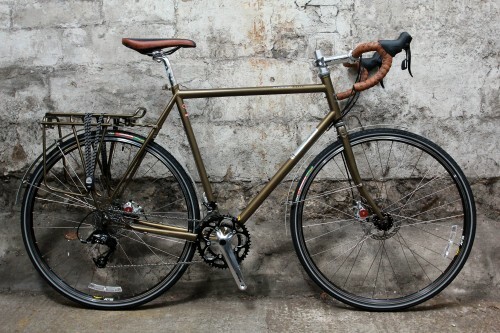 For this price (£1149) you could buy a Singular Peregrine F&F and get it built up to a reasonable spec (at a good bike shop outside London). IMO the Peregrine is the ultimate disc braked all-rounder (but I am biased as I am in love with mine).